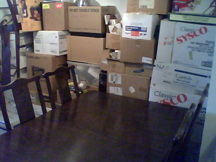 The solution, a wall of boxes. 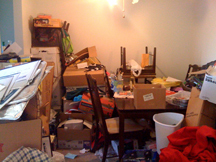 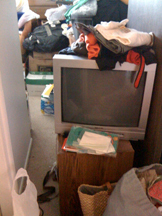 We help clients clear up their space as we best can so they can pass inspection and keep their home. 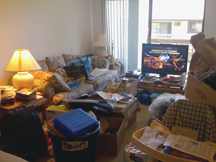 Even when the client is willing to let go of a lot of stuff, as was in this case, it was a challenge to find a space to store the items that they are not ready to part with. 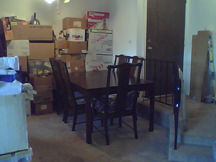 We moved the dining room table away from the wall. 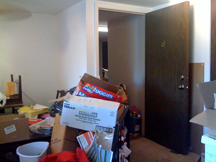 The back wall did not have any heating or AC vents or electrical outlets. 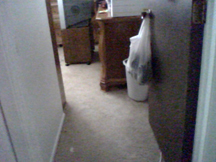 We decided to line the wall with the boxes being kept. 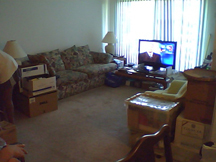 Ideally I would have loved to set up a curtain to cover the wall of boxes but sadly it was not within our budget. 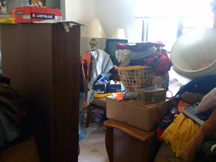 Moving the boxes to the back wall allowed us to clear the home. 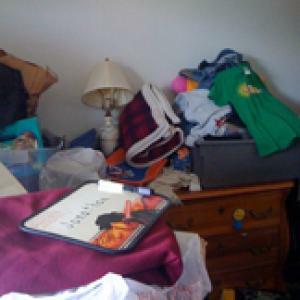 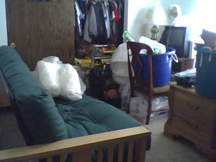 The second bedroom was cleared so her son could have his own room. 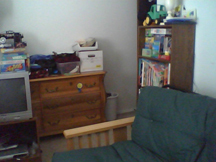 Her son was very excited to have his own room with easy assess to his toys.